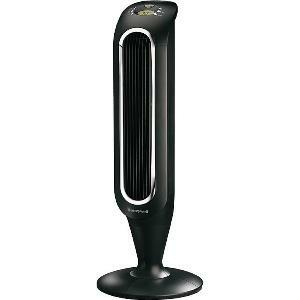 Honeywell Fresh Breeze Tower Fan Review – Does It Live Up to the Buzz? I don’t have to tell you how taxing it can be on your physical health. If you live anywhere near Seattle like I do, “Heat” can be intense. A handful of things can keep you cool amidst the scorching temperatures of Arizona. A cold shower and a “Fan” that blows cool air towards you. I’m not a big fan of Ceiling fans. Most of the time, these are too high to make any difference to the temperature of the room. Instead, I favor “Tower-Style” fans that remain close and parallel to the user. This way, the air travels directly towards the user. Air has less distance to travel and thus remains cool. Products like Honeywell Fresh Breeze Tower Fan have temperature control that allows users to achieve that feat. This little product packs the punch when it comes to myriad features and benefits. Here’s my review of this Honeywell HY-048BP explaining why I’m singing such high praises of this fan. I had my fair share of experience with fans hailing from Seattle. Yet, 6 months back, it was my first time with a tower fan from Honeywell. I must say, I liked the hard plastic build of Honeywell HY-048BP more than other fans of this kind. Polished “Black” color will intrigue you immediately. It pairs up with nicely set control panel (which I’ll get to later). It doesn’t eat up a lot of your space. In fact, this little thing is 41-1/2 inches high and depending on where you are looking from, the width can be 6 to 7-1/2 inches. That’s pretty sleek if you ask me! There’s a remote control tagging along with the package. It sets itself well with tightly on top of the device (just below the LED lights). When you take it out, it leaves a gap on the machine. Oh, and the base is sitting pretty at almost 14 inches’ width. I don’t particularly like the base though. It seemed flimsy to be honest. I was amazed to see it could fit in this many buttons (6 to be exact) on the panel with this budget. Each of these buttons is easy to get your hand around. You don’t need any manual to understand what these things do. The operation is pretty simple on its own. For example, the “Power” button turns it on and off. You have to thank this button for the “Auto Shutoff” feature as well. It does what the name suggests. 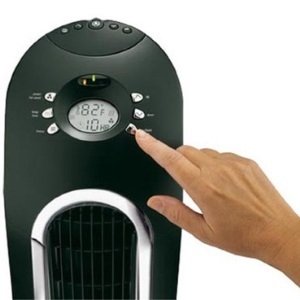 You can shut the fan down at different intervals depending on how you feel. Feel free to move the fan up or down with the help of corresponding buttons as well. I don’t have to tell you that you can move the fan sideways too with the oscillation button it has. This little button allows for effective air distribution. How could I forget the “Temperature” buttons? Yup. You can regulate temperature comprehensively with this 3-setting system. Why The “Temperature Control” Deserves a Shout? This is the USP of Honeywell HY-048BP in my judgment. What makes temperature control unique is the way it behaves. Let me tell you, the fan’s not like others in its league. The HY-0488BP acts more as a thermostat when you tamper with the temperature controls. Yes, you can press the “Mode” button and play with the temperature settings by pressing up and down. Temperature increases or decreases by “Two” degrees each time you press up or down. Once people set the value, the fan will only activate if the heat in the room is greater or at the set parameters. It will cool the temperature down to the set value and turn off automatically. Thus, people won’t have to babysit the fan every two hours. Call it “Auto Pilot” mode if you would. It works like a charm! What about Oscillation Mode and Blades? These two go hand in hand in my opinion. The fan moves up, down, and sideways to circulate the air. One can dictate how forceful the air will be. What I like most is how you can simulate the outdoor breeze with the controls onboard the device. Manufacturers tilted the head ever so slightly. This helps this device to bring in more air than its peers. The air quality is awesome thanks to the blades of this fan. These “Turbo Wind Generator” blades can spin with tremendous force or simulate that cool breeze that I was talking about earlier in my review. This Little Fan Comes with an Ionizer and Filter! Don’t think that Honeywell Fresh Breeze Tower Fan Review is done only after “Four” features and their benefits! No sir! I could still write two pages’ worth of praises at least. But I won’t. Instead, I’ll be focusing on a feature that offers heaps of benefits for the elderly and people with allergies. The filtration system. The Ionizer allows healthy air to pass on after being cooled. The filtration system keeps dust and pollen out of your room for as long as the device operates. I can assure you of clean air as I’ve been using this thing for almost seven months now. One can also clean the filter by hand if he or she chooses to. It is really easy to take out and clean with soaps or any other cleaning agent. I’ve cleaned the filter once. I’d advise against changing the filter too soon. Cleaning has been the best way to avoid dirt clogs for me so far. The overall design, height, width and coloring makes it one of the stylish products around. I like the remote control and infrared lights that offer visibility at night without hampering sleep for users. This fan has “Curved Turbo Wind” blades that push more air into the room than others. Temperature driven auto On/Off system drives it home for me. I have to mention the competent control panel with LCD display that allows for a clear visibility. Umm… The flimsy design at the base may cause the fan to tip over if you are not careful. The noise level is what I have a tiny beef with. I can’t help but notice it while I sleep with the fan on. Let’s Wrap This Thing Up! I get why an oscillating fan might be like gambling for some people. I was skeptical at first too! Seeing numerous Honeywell HY-048BP singing high praises motivated me to buy this piece of tech. Frankly, it has done wonders in terms of providing cool and “Clean” air for me. I’d certainly not compare it to high-end ACs. 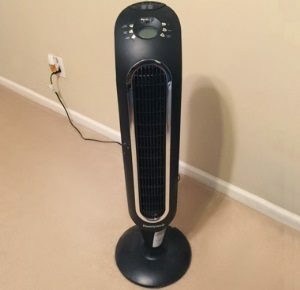 Yet, for those of you who have a limited budget and want to get the best of both worlds, get Honeywell Fresh Breeze Tower Fan with Remote Control. Let me assure you, air purification filter, temperature control, and the blades integrated into the design work perfectly to deliver soothing atmosphere on hot summer days. Also, you don’t have to suffer from a rude awakening just to turn the fan off in the middle of the night. There’s Auto Shutoff in play. Despite minor flaws, it will gallop its way to longevity for at least five years. What more do you need?